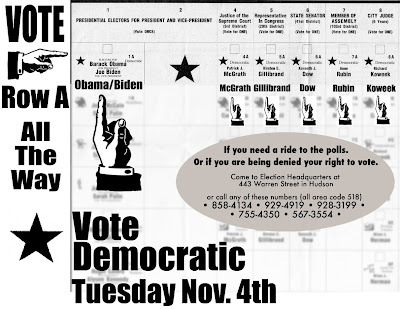 Hudson City Democrats: Trouble Voting? Need a Ride? We've Got Your Back! Print This Flyer! Trouble Voting? Need a Ride? We've Got Your Back! Print This Flyer! The flyer which is attached to this post can protect your right to vote. If you need a ride to the polls we will have people standing by all day to take anyone who needs one. If you are told that your name is not listed in the poll book, first ask your poll inspector to be certain you are in the right polling place and election district. If after checking you still are not in the book, you can insist that the poll inspector call the Board of Elections. You can also walk in at the Board of Elections at 401 State Street in Hudson. If after speaking with someone at the Board you still have not been allowed to vote either walk in to to the Hudson Democrats Election Office at 443 Warren Street or call us on the numbers listed below. If you are denied your right to vote anywhere in Columbia County we will have volunteer election workers and attorneys available all day to help troubleshoot any problems you may have. If needed we can ask for a judge to order that you be allowed to vote. Don't take no for an answer and throw your vote away until you have checked with us first! If you believe that you are being denied your right to vote. Come to Election Headquarters at 443 Warren Street in Hudson or call any of these numbers.